Decius' alleged persecution of Christianity attracted little notice outside of Christian circles, nor is there any clear information connecting Herennius and Hostilian to these religious policies. 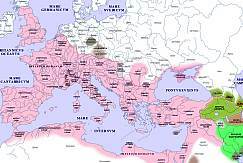 In fact, concern over the precarious Danubian frontier dominated the joint reign of Decius and his sons, to such an extent that Decius sent Herennius ahead to Illyricum very soon after he secured power. [] Following serious incursions into Dacia and Moesia by the Carpi and Goths, Decius and Herennius Etruscus led an expeditionary force against the Gothic king Cniva. The barbarians were on their way to their homelands, laden with booty after their successful campaigns, as the two sides met at Abrittus (Hisarlak, near Razgrad in modern Bulgaria). Cniva was able to lure his adversaries into a swampy area, and thereafter everything fell into place for the Goths. Cniva broke his force into several tactical groups, surrounded the Roman army, and nearly destroyed it. Herennius was struck down by an arrow early in the battle. Trying to console his men, his father is said to have remarked that the loss of but one soldier mattered little to him. [] Trebonianus Gallus' desperate efforts to salvage some remnant of the expedition from the slaughter were insufficient to save the lives of either Augustus. Alföldi, A. "The Crisis of the Empire," in The Cambridge Ancient History XII, 2nd ed., 1939, pp.165-231. Franke, T. "Herennius Etruscus," in Der neue Pauly 5, 1996, p. 251. Mattingly, H., et al. The Roman Imperial Coinage IV.3, London, 1949. Syme, R. Emperors and Biography: Studies in the Historia Augusta, Oxford, 1971. Wolfrom, H., tr. T. Dunlap, History of the Goths, Berkeley and Los Angeles, 1988. [] Zosimus 1.12.1; Johannes Antiochenus, FHG IV, pp. 597-598. [] Der Neue Pauly 5 (1998), 413. [] See, for example, CIL 2.4958, AE 1942/43, 55; ILS 515, 516, and 517 (= CIL 3.5988, 3.3746, and 2.4957, respectively). The numismatic evidence throws little light on official distinctions between the brothers; Hostilian is only sparsely depicted in the coinage, and all but a few of his coins are from 251. [] The epigraphic evidence is unclear. See ILS 518, 519, and 520 (= CIL 11.3088, 6.1101, 6.1102). Herennius' full name and title was Imperator Caesar Quintus Herennius Etruscus Messius Decius Augustus; Hostilian's was Imperator Caesar Gaius Valens Hostilianus Messius Quintus Augustus. [] All coins which refer to Hostilian as Augustus were issued under his father's successor. See RIC 4.3, pp. 109-110 and 143. ILS 521 (= CIL 9.4056), a dedication to the Augusta Herennia Cupressenia Etruscilla, includes the title "Mother of the Augusti" (matri Augg.). The plural 'Augusti' must have been used for convenience's sake. [] Victor, 29.2. Decius stayed behind to dedicate the monuments he had constructed. [] Victor, 29.5. "detrimentum unius militis parum videri sibi." For the Battle of Abrittus, see Wolfram, History of the Goths, pp. 45-47. 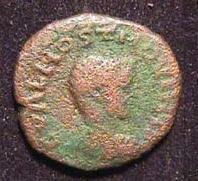 [] Gallus countered the expectations of many by appointing Hostilian Augustus, and made his own son, Volusianus, Caesar. See RIC 4.3, p. 151. According to Zosimus (1.25) Gallus adopted Hostilian, but the same author also accuses Gallus of murdering the young Augustus. On this point Zosimus' veracity is dubitable, since such political murders were among the most hackneyed themes of Roman historiography. [] Victor, 30.2; Alföldi, CAH XII, pp. 167-168. [] Eutropius, 9.4. No supporting evidence is found for this particular assertion. [] Gibbon, vol. I, chapter 10. An apparent echo of the Historia Augusta, Divus Aurelianus 42.5-6, where the author reviews all the good and bad emperors from Augustus to Diocletian. He concludes, "So you see how few are the good princes . . . yet I must except the Decii, whose life -- and death -- is worthy to be compared to the ancients." (Vides, quaeso, quam pauci sint principes boni . . . Tametsi Decios excerpere debeam, quorum et vita et mors veteribus comparanda est). Copyright (C) 2001, Christopher J. Fuhrmann. This file may be copied on the condition that the entire contents, including the header and this copyright notice, remain intact. Comments to: Christopher J. Fuhrmann.